“What do you want to do when you grow up?” This is a question that most young people probably get asked at some point, and very often the answer will be something connected with what they like doing, or something they’re good at, or perhaps something wonderfully ambitious but hopelessly unrealistic. For any young person starting to think about their future, looking at career options which not only appeal to their interests and abilities, but which are also realistic in the context of available jobs, is not at all easy. In fact, it can often be a daunting business, partly because they are stepping into the world of the unknown, but also because the advice often given isn’t particularly helpful in terms of equipping them with what they need to make good decisions. 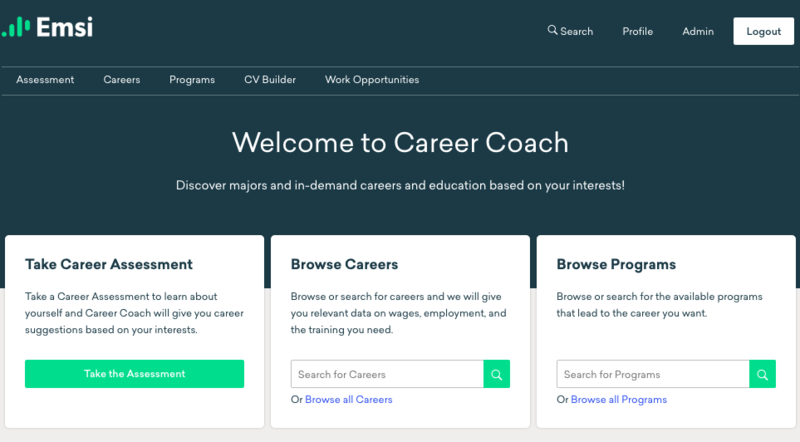 We have now revamped our Career Coach tool to include all of these elements, and have updated the design to offer a hugely improved user experience. Our remit was simply this: how can we help education providers make the careers journey — from initial thoughts all the way through to getting a job — as smooth and seamless as possible for the young people who come through their doors? When a person begins to think about potential careers, the huge array of different possibilities out there can appear to be both confusing and daunting. What every young person needs at the start of their careers journey is a signpost: some way of narrowing the options down to those careers that are most suited to their interests and abilities. We’ve redesigned Career Coach to begin with such a signpost. In fact, we have two: a Quick Start Assessment, which asks six very basic questions, or they can take a more Detailed Assessment, which includes 60 questions. After completing one of these, the tool points users to those careers that are the best fit based on their answers. One of the complaints made against a lot of careers advice and guidance is that too often it is centred around young people’s interests and ambitions, but has little or no connection to actual job demand. This means that you often end up with people going through their training, looking forward to the day when they start a job that really excites and interests them, only to find out when they start to look for a job connected to their training that there aren’t any. This is why after using the Assessment to hone in on potential career matches, the next step on the journey is to give them a wealth of insight on those occupations in their area. This includes things like job demand, salary expectations, transferable skills and similar careers. In a nutshell, it’s all about giving people the knowledge and understanding they need, so that they can feel empowered to make good, informed decisions. Having gained an idea of the sorts of careers they might look to do, and having then been given insight on the demand for these and similar roles in their area, the next question on the careers journey is: what training do I need to do to get where I want to be? The heart of Career Coach has always been its ability not just to give people insight on occupations in their area, but also to link this back to related courses offered by the education provider. 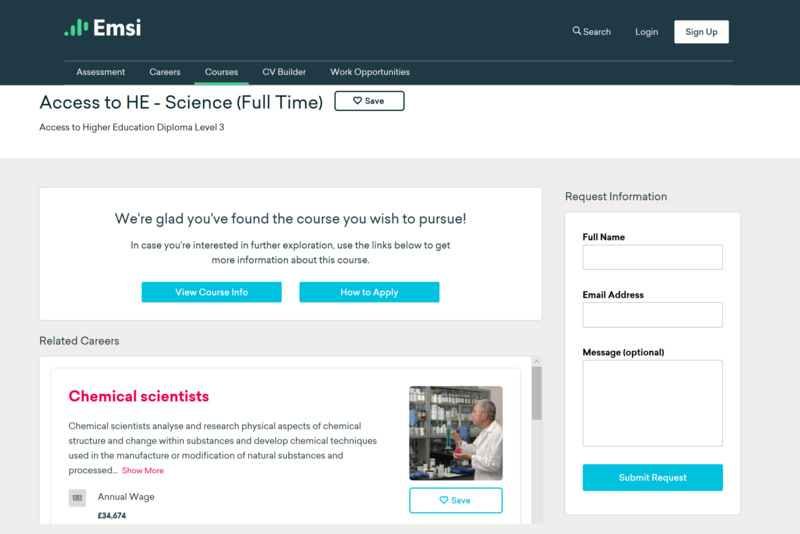 What we’ve done with the new version is to keep this link, but with a brand new design so that it is now far more intuitive and much easier to navigate — all part of that smooth and seamless careers journey we are trying to create. Having helped people to evaluate their career options through the Assessment, given them the insight they need to make informed decisions about those potential careers based on labour market realities, and having then shown them what training is available to help them get the job they want, the final part of the journey is to help them as they start looking for a job. The new Career Coach is designed to take people on this last part of the careers journey in a number of ways. Improved CV Builder — The CV builder now allow users to store multiple CVs for different roles, and they can now save, edit and download these from their account. 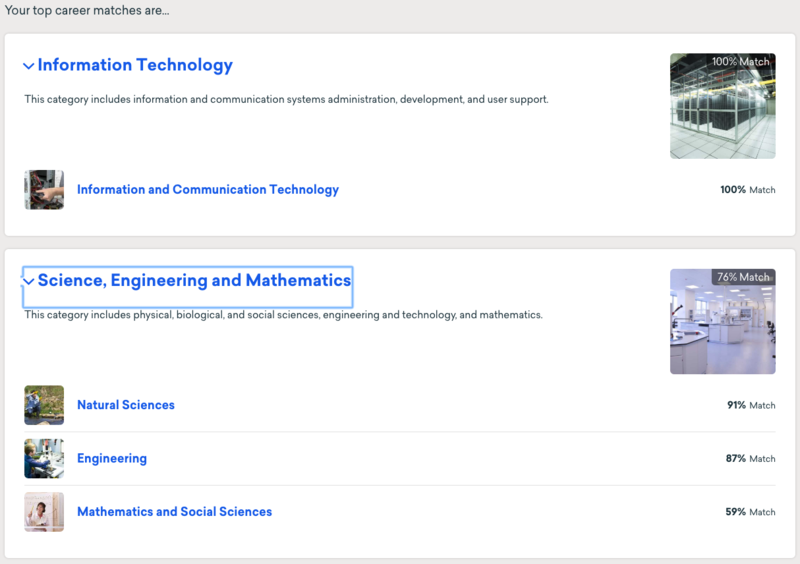 Job Postings Data — We’ve also added localised Job Postings Data, which helps users get a sense of skills demand, as well as the names of employers who are hiring for these jobs. Employer Portal — This enables the provider to grant access to the tool to local employers, who can then post their job vacancies straight onto the site. 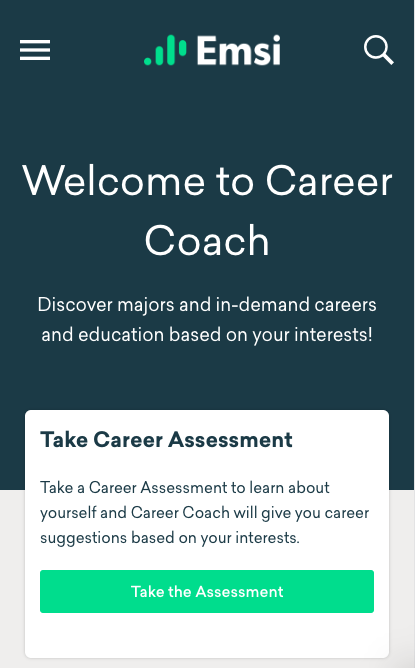 With a number of other new features built into the tool, such as a responsive design to make it both mobile and tablet friendly, plus user analytics to give providers detailed metrics on who is searching and what they’re looking for, new Career Coach really is set to make a huge difference. Education providers now have a smooth and seamless way to guide young people from their initial careers thoughts all the way to a job, via the training they offer. And young people themselves, faced with what can often look like daunting prospect, can now embark on that careers journey with far more confidence that they are heading in the right direction. We are hosting a webinar on 31st January to demonstrate the redesigned Career Coach and how it can help your organisation. To register, click on the button below.